In an ideal world, all toys would be safe and there would be no need for worry. 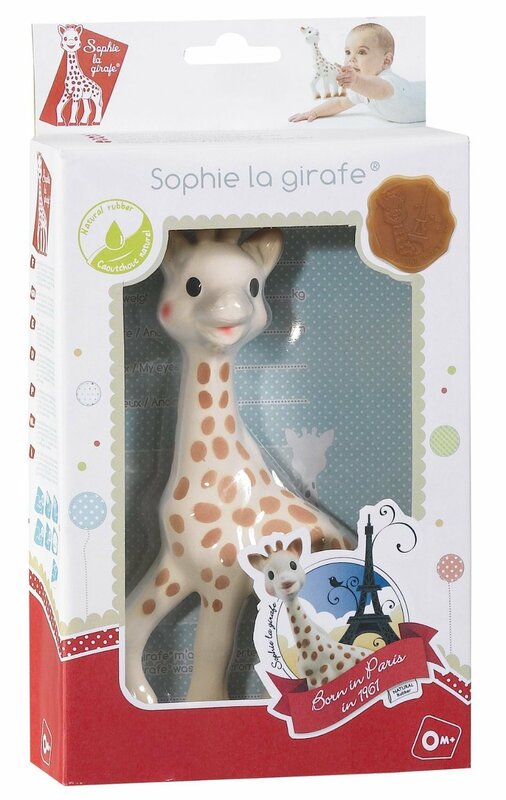 There would be no toy recalls and no toys with unsafe levels of lead or BPA. Obviously, that’s not the case and most toy manufacturers won’t think twice about using PVC in their toys or paint sourced from China. Since mainstream toys can contain toxic chemicals and heavy metals (and since babies put everything in their mouth), we as conscious parents must choose safer, non-toxic baby toys whenever possible I’ve put together this guide to some of the best manufacturers of non-toxic baby toys. This isn’t an exhaustive list; for example, I’ve left off some companies whose toys I personally wouldn’t buy (so therefore I can’t really recommend them to you!). And I’m sure there are other companies out there that meet my criteria that I haven’t come across yet. 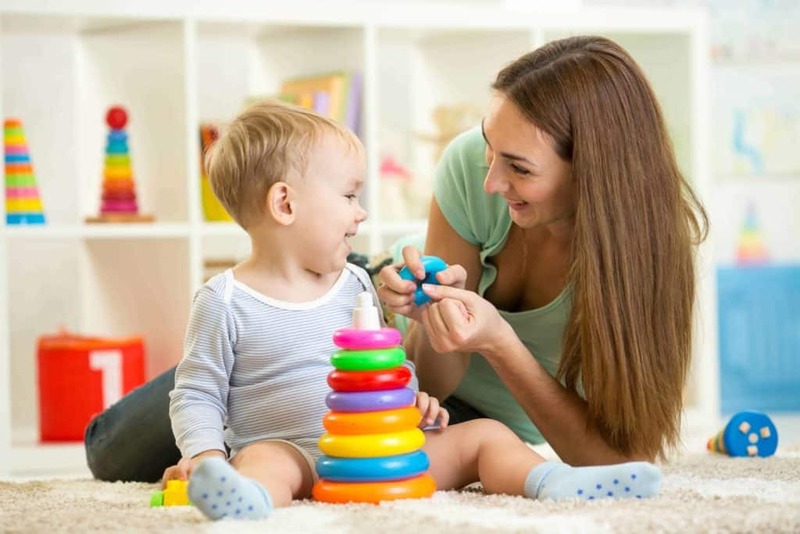 But if you’re looking for the safest non-toxic baby toys, this buying guide will be your map to finding fun and safe toys for your baby and toddler. Can You Realistically Avoid Plastic Toys? The great news is that the number of toy recalls has dropped significantly. In 2017, there have been “only” 28 toy recalls and none of those have been due to lead. Toys sold in the United States are regulated by the Consumer Product Safety Commission (CPSC), which has a long list of rules that toy manufacturers must follow to ensure the safety of their products. Toys for children ages 12 and under must be tested and certified to meet these toy safety standards by a third-party laboratory before they can go to market. 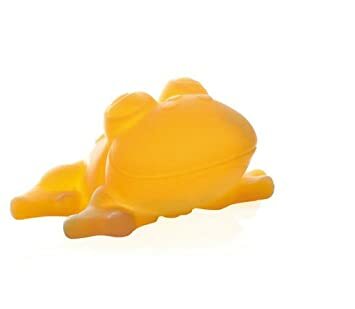 The CPSC has taken a hard stance on phthalates in toys and has helped educate consumers about the dangers of flame retardants. Reason #2: CPSC standards are good, but not good enough in my opinion. 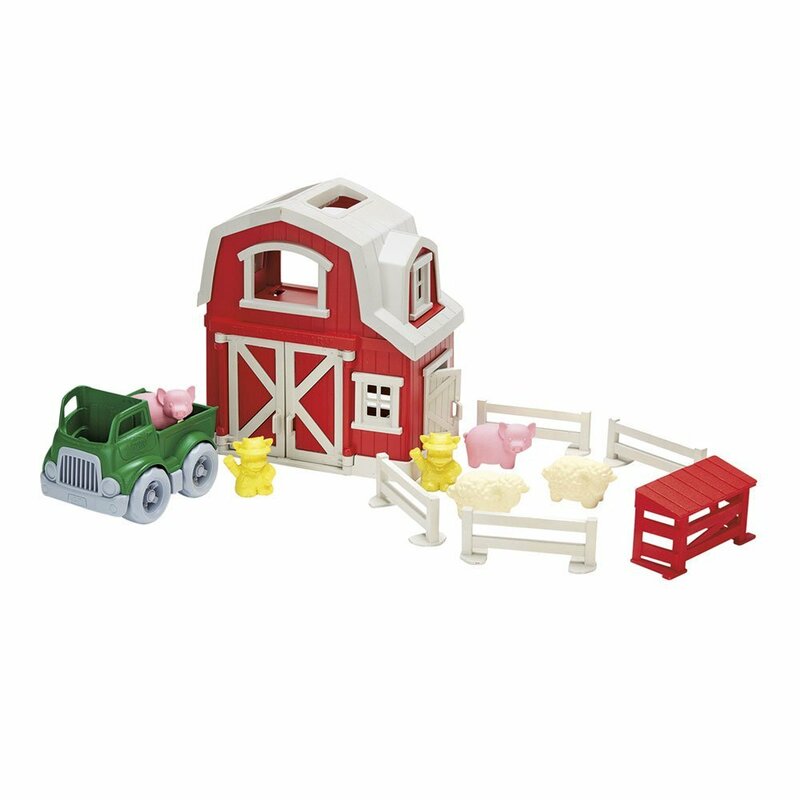 Toys can comply with CPSC regulations still contain heavy metals, BPA, or phthalates. Toys can still be made with PVC. Not all phthalates are banned in children’s toys, and not every part of a toy must be tested to meet toy safety standards. It’s complicated, and I’m learning more as I dive deeper into CPSC requirements. You might be able to avoid plastic toys while your baby is little. But it gets harder and harder as your baby gets older. Though you have the most control over the toys you buy, your child will receive toys as gifts. They will play with mainstream toys outside of the home. And they will be exposed to expensive marketing campaigns from the big toy manufacturers. Plastic toys are everywhere, and a lot of the popular toys your child will want as they get older will come from mainstream toy brands. Personally, I try to follow the 80/20 rule and realize that mainstream toys are hard to avoid. 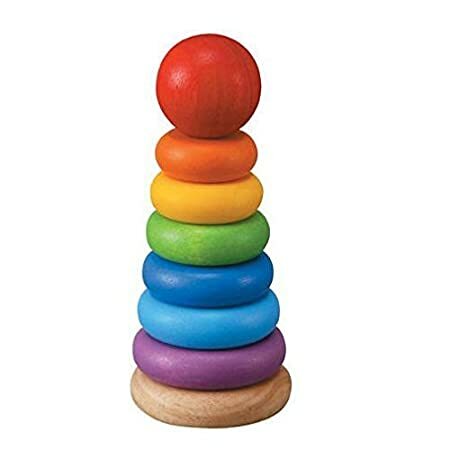 I just try to limit the time my kids spend playing with these toys (which is easier when they are younger), and try not to let them put these toys in their mouths. PlanToys: Made in Thailand. 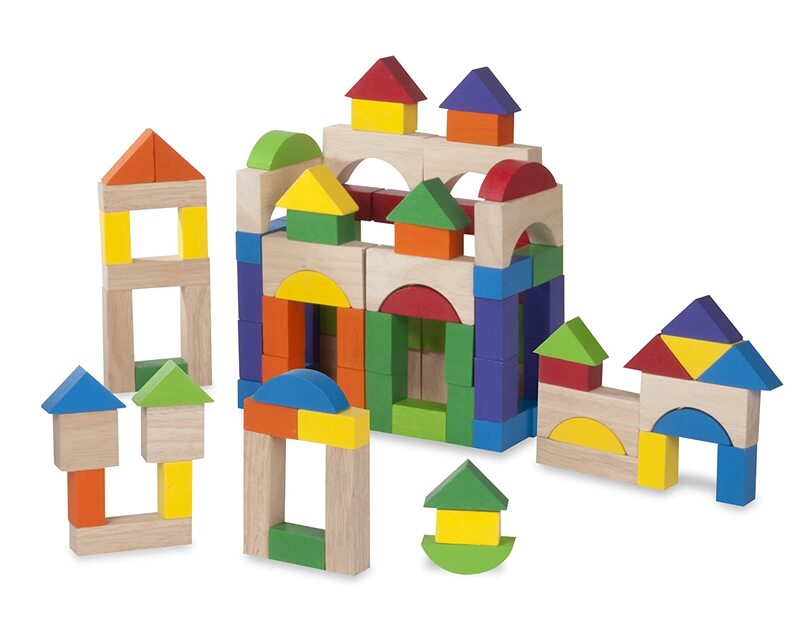 PlanToys makes wonderful wooden toys that spark the imagination. We love playing with their unique, creative toys. PlanToys sends the message of sustainable play because of the materials it uses. Their toys are made in Thailand using trees that no longer produce latex. A chemical-free kiln drying process is also used to strengthen the wood used in the company’s toys. And they only use organic pigments and water-based dyes. 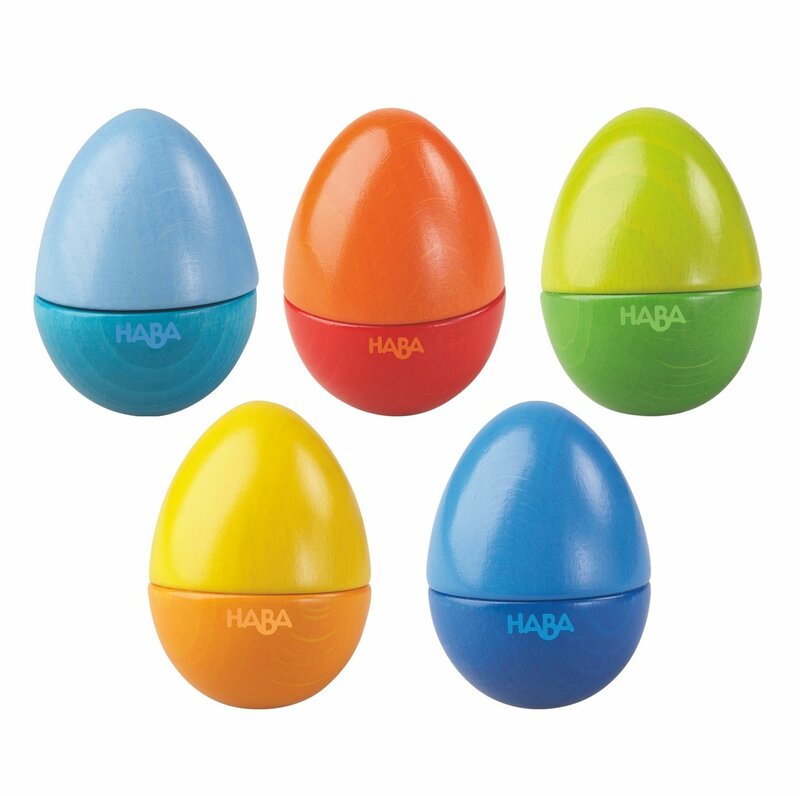 HABA: Made in Germany. 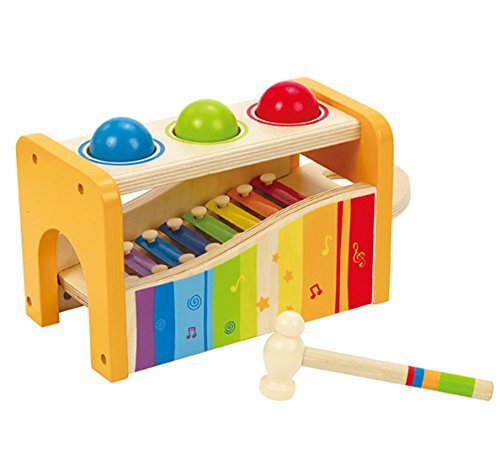 HABA makes high-quality wooden toys that have a classic, “cheerful” vibe to them (as the company puts it). Their toys are so well-made and they should last you for years. 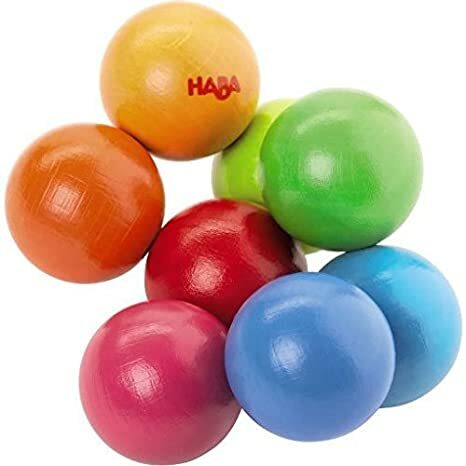 And the great news is that the majority of HABA toys are made in Germany (but the bad news is that some of the toys, like the soft-bodied dolls are made in China). So, perhaps the best advice is to stick with the wood baby toys and steer clear of their dolls. HABA is one of the only companies that uses PEFC certified beechwood or maple, which means the wood comes from reforested trees. They also use non-toxic water-based lacquers, not paints. Their toys are well-made and resistant to wear and tear. 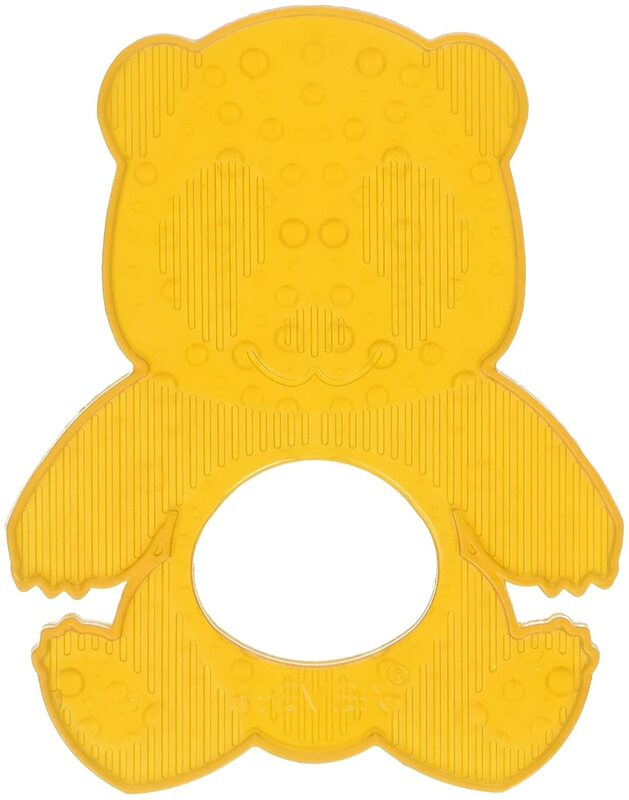 They have a great selection of clutching and teething toys for young babies, as well as toys for toddlers and big kids. TAG Toys: Made in the USA. TAG Toys is a family-run business that makes toys for children ages 1-6. All TAG toys are manufactured at the company’s California plant. 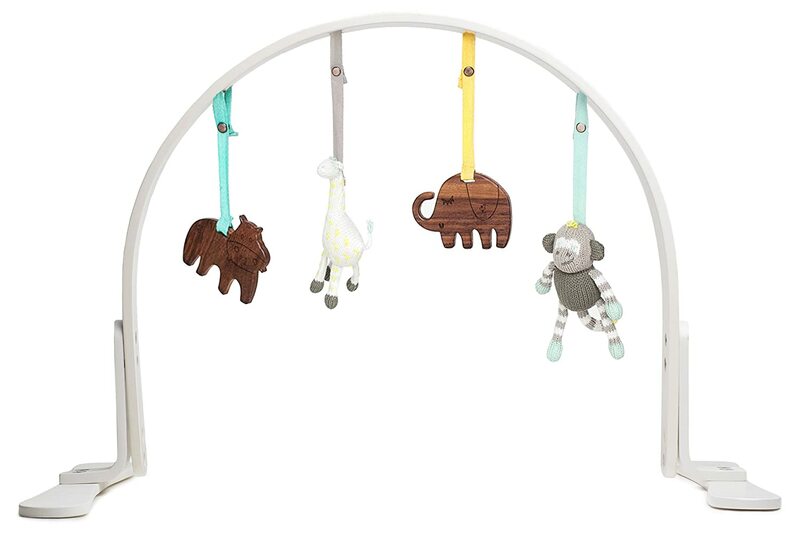 Non-toxic water-based paints and glues and natural wood are the only materials used to make these baby toys. 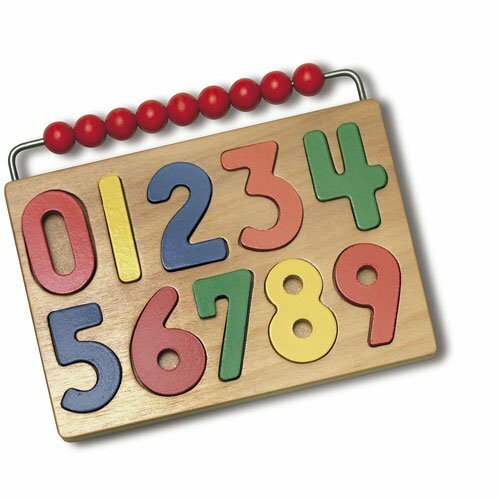 They are high quality toys that you can feel good buying for your baby as they grow into toddlerhood. Grimm’s Spiel and Holz: Made in Germany. From dolls to wooden puzzles and stacking toys, this company is committed to making non-toxic baby toys. When you buy any of the toys from Grimm’s Spiel and Holz you can be sure that none of them were made in China. All of the design work, assembly, and finish is done in Germany with just some woodworking outsourced to some European shops. 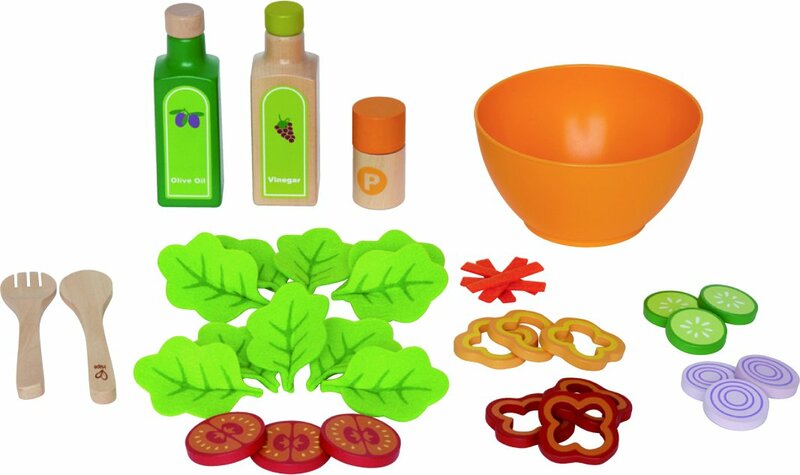 The wood used in their toys is from alder, lime, beech and maple trees, and the colors and oils used are non-toxic. 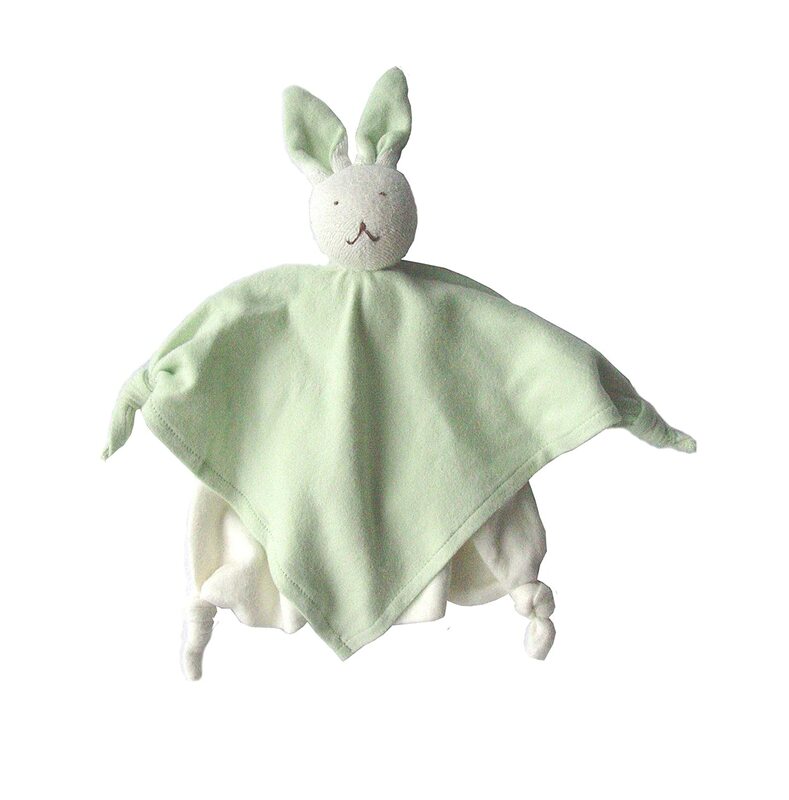 The fabrics on their dolls are Oeko-Tex certified. 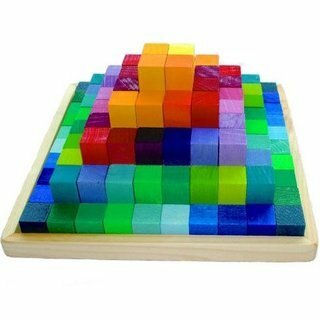 The company is probably most recognized for their Waldorf-style rainbow stacking blocks. 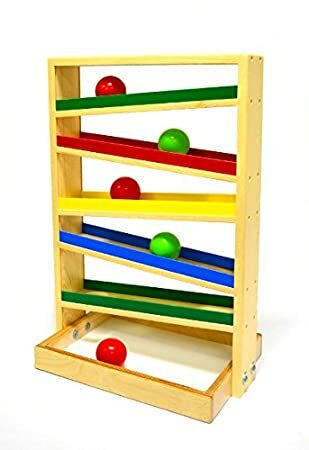 But they have a wide variety of blocks, stacking toys, teethers, and unique toys. 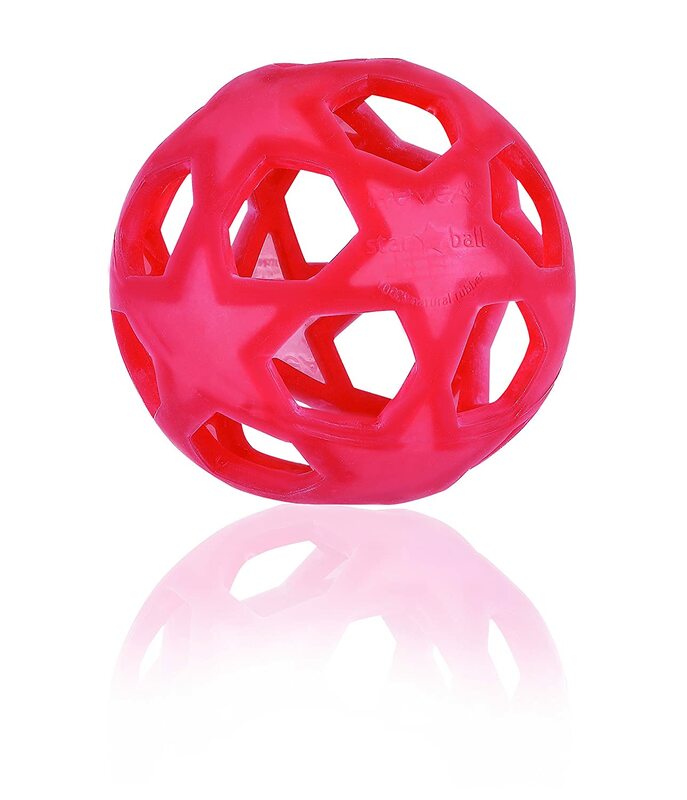 Their toys can run on the pricey side, but the quality is very good and the toys will last a long time. 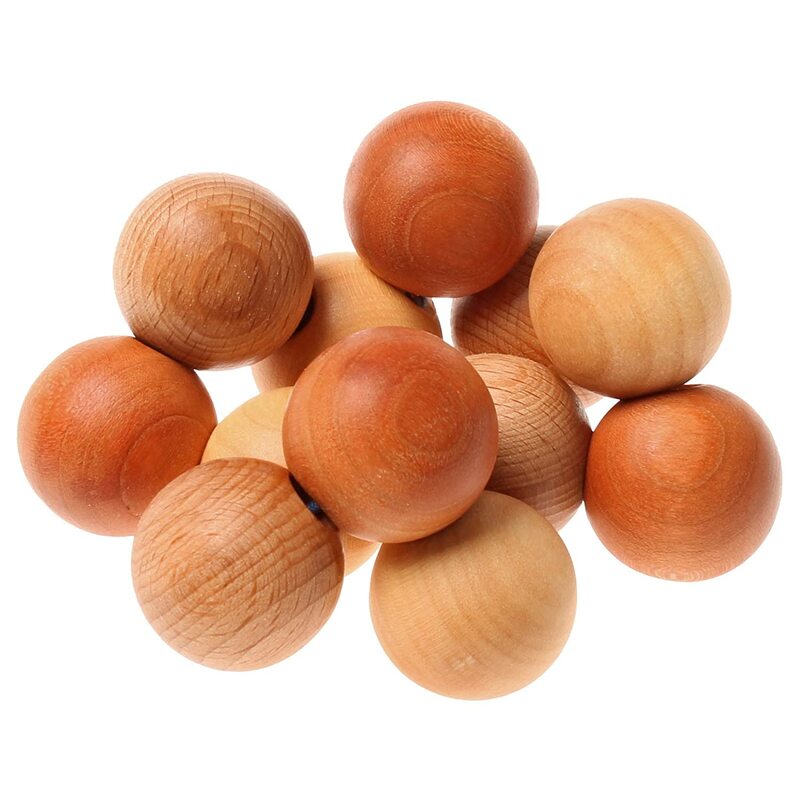 I love their natural wooden baby rattle toy (pictured below) because I don’t have to worry about toxic dyes. Wonderworld: Made in Thailand. 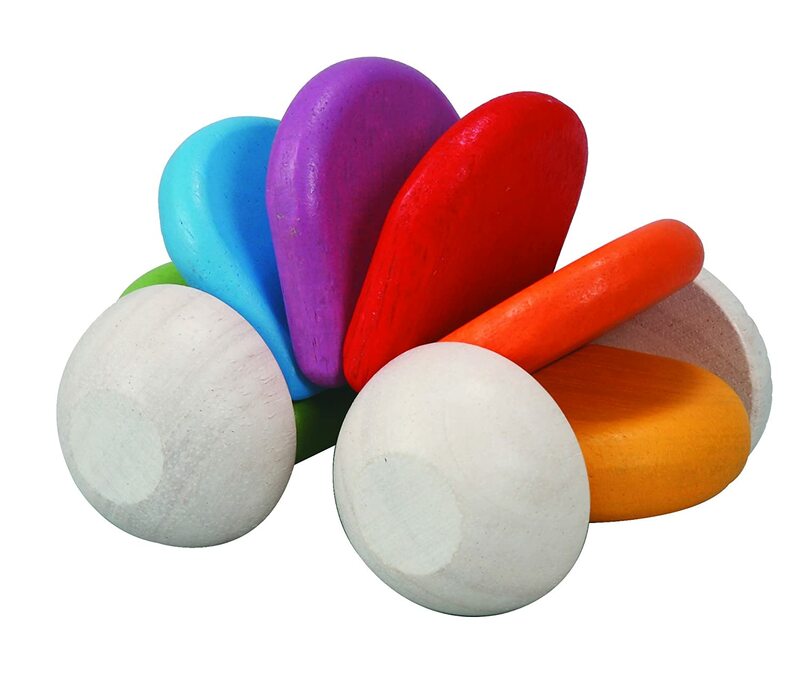 Wonderworld toys are made and designed in Thailand and use rubber-wood as their primary material. All paints are water-based and non-toxic. 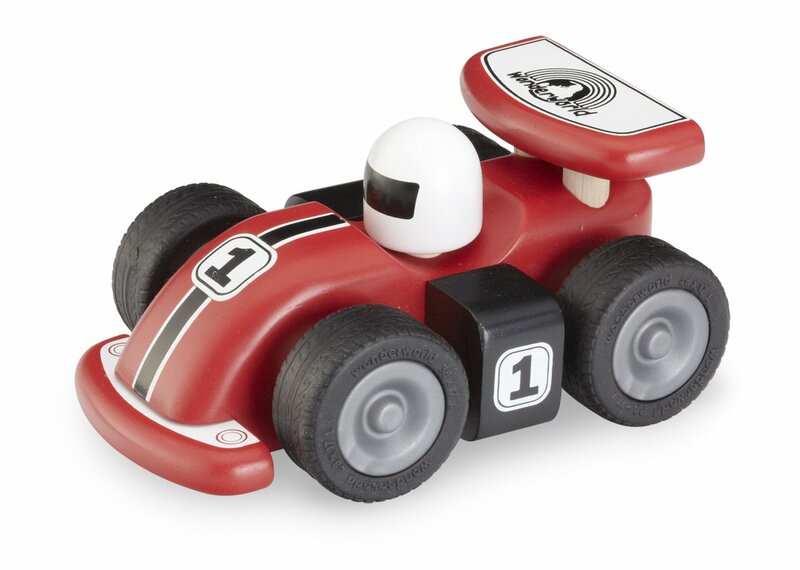 They have a great collection of vehicle toys, blocks, and a lot of great toys for toddlers and bigger kids. Uncle Goose: Made in the USA. Let’s hear it for another company with only U.S. made products! 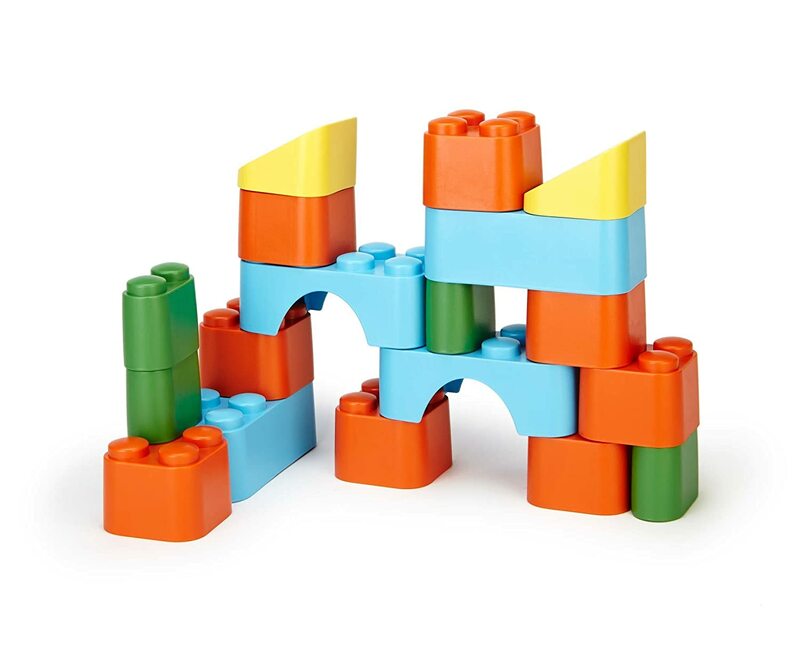 Uncle Goose makes a childhood staple…blocks. 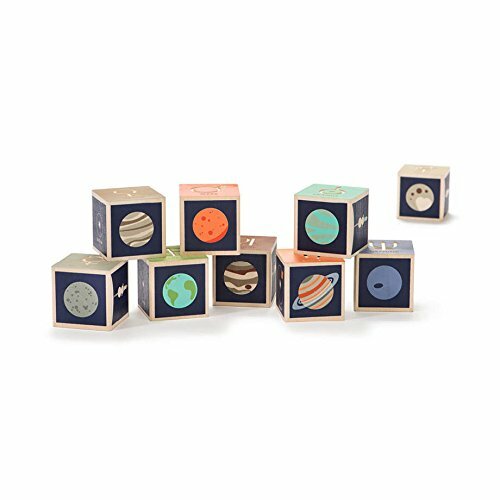 There is a variety to choose from – 62 different sets to be exact – including everything from ABC and number blocks to blocks with animals, planets, and bugs on them. 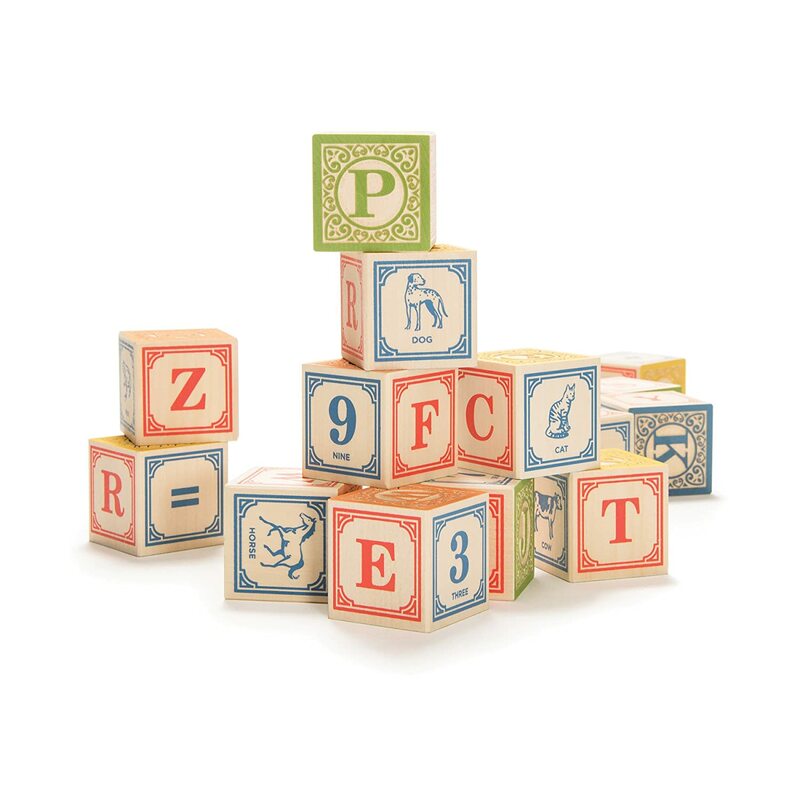 They even have blocks with the periodic table on them (though I got excited about this, I don’t mean to recommend these for babies…for obvious reasons). 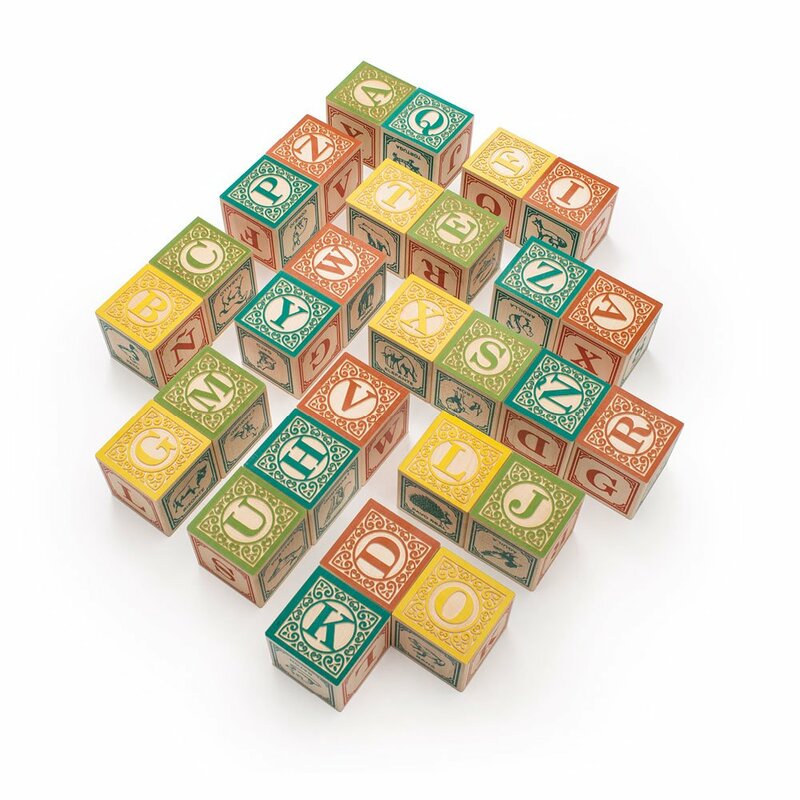 Another great thing about Uncle Goose is that they make foreign-language blocks in 23 different languages including French, Thai, Chinese, and Danish; this is perfect if you are trying to introduce a second language. 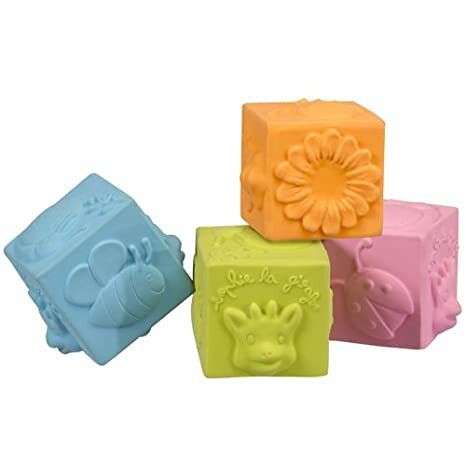 If you are looking for non-toxic baby blocks, Uncle Goose is your go-to. And just know that whichever set you go with was hand-made with materials from around the Great Lakes area. Only non-toxic, child-safe inks are used (and are sourced from an American manufacturer), and no sealants are applied. The company doesn’t recommend letting your baby use them as teething toys, but they are technically supposed to be safe if they do end up in your baby’s mouth. Hape: Made in China. 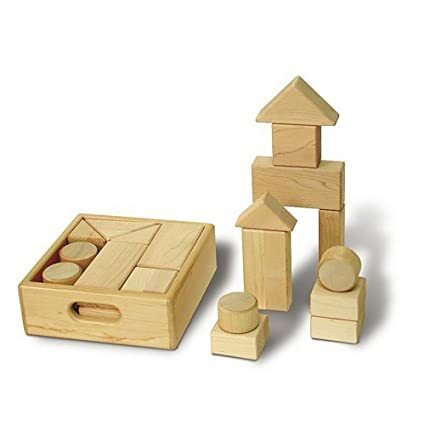 While Hape makes high-quality wooden toys that will last for years, their products are made in China despite the fact that it is a German company. 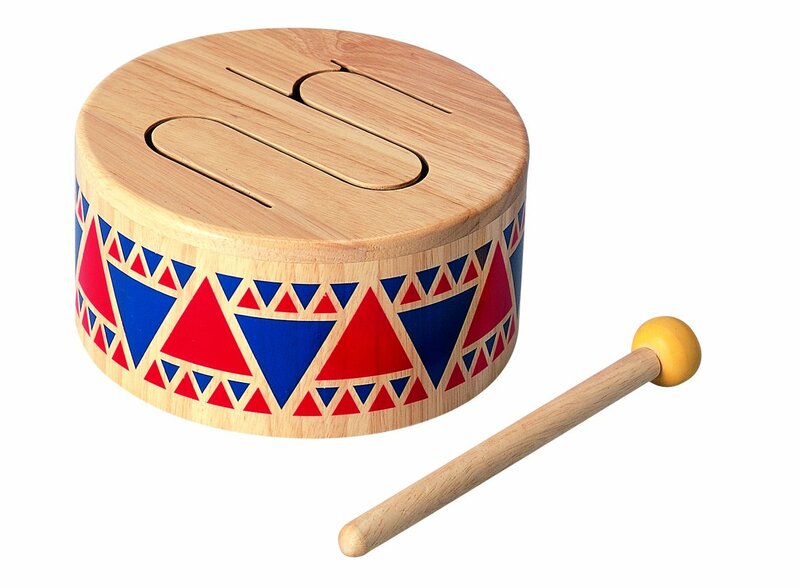 Their toys are made with natural materials such as sustainable wood or bamboo and are finished with water-based paints. I struggled with whether I should include them on this list, just because they are made in China. 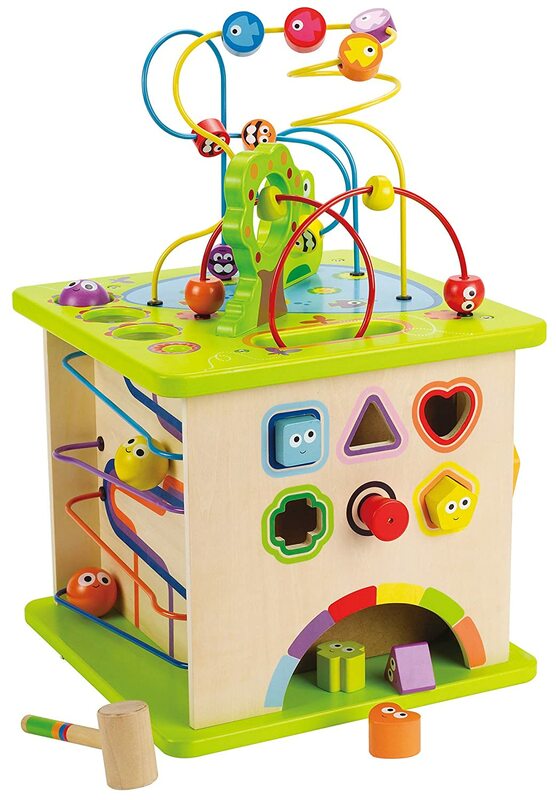 But we own several Hape toys, and can attest to their quality, but I really wish they would manufacture their toys in a country with more reliable standards. Bears for Humanity: Made in the USA. 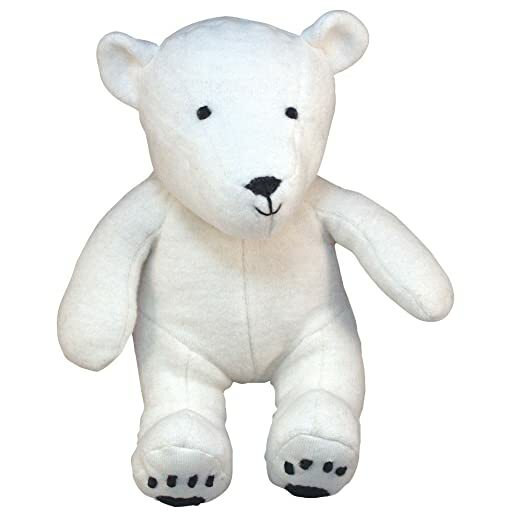 Bears for Humanity makes adorable organic teddy bears and organic stuffed animals, right here in the United States. 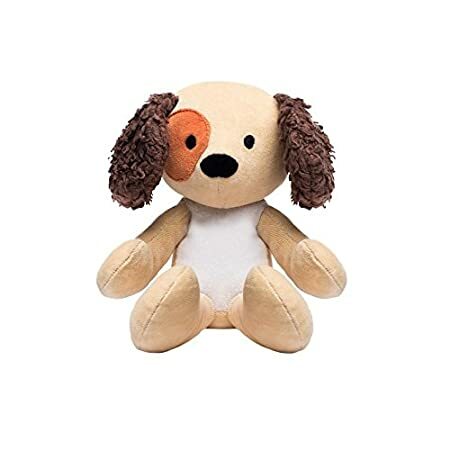 Their stuffies are made 100% GOTS-certified cotton. 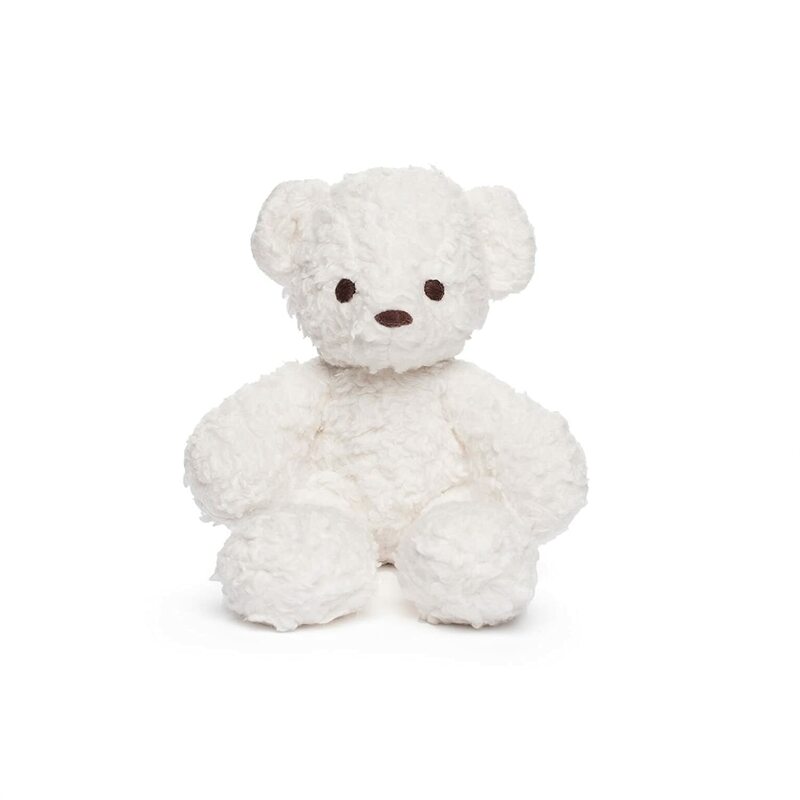 A California mom started this company after realizing there weren’t any organic teddy bears out there. What’s even better is that for every bear sold, one bear gets donated to a child in need. And, they are reasonably priced for being organic – love that! We have had a Bears for Humanity teddy bear for over two years now, and it has held up exceptionally well. 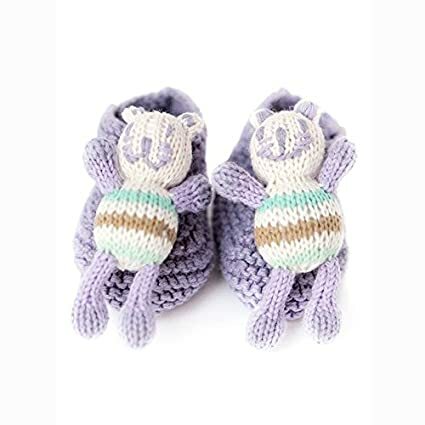 I definitely recommend these for your little one. I feel comfortable allowing my toddler to sleep with his bear. Under the Nile: Made in Egypt. Under the Nile makes organic baby toys and clothes using 100% organic Egyptian cotton by the company’s fair trade partner in Egypt. No BPA, lead, or harmful chemicals are used in the making of its toys. Under the Nile was the first baby clothing company in the U.S. to be certified by GOTS. You’ll find Under the Nile products listed on my bathing and baby clothes guides as well. Overall, a great company that makes quality products. 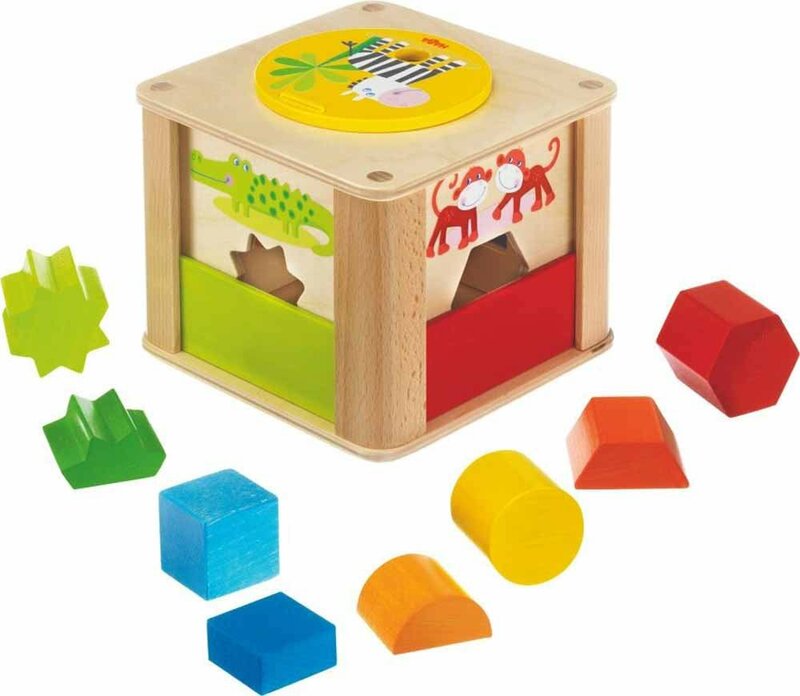 In addition to their Sophie teething toys (and there are now a few different types of them), Vulli also makes great toys for your baby’s first year: rubber blocks, rubber balls, rattles, and more. Hevea Planet: Made in Malaysia and other locations. 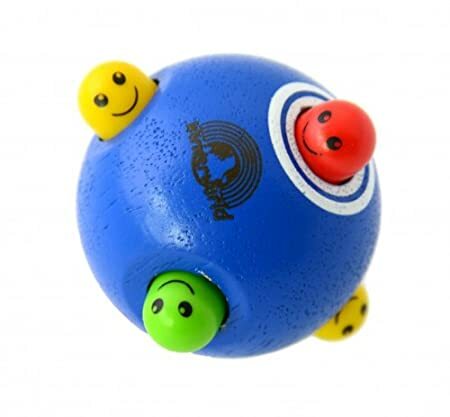 Hevea planet is another company that uses eco-friendly materials like natural rubber, and manufactures their products has baby products in places like Malaysia and Morocco. 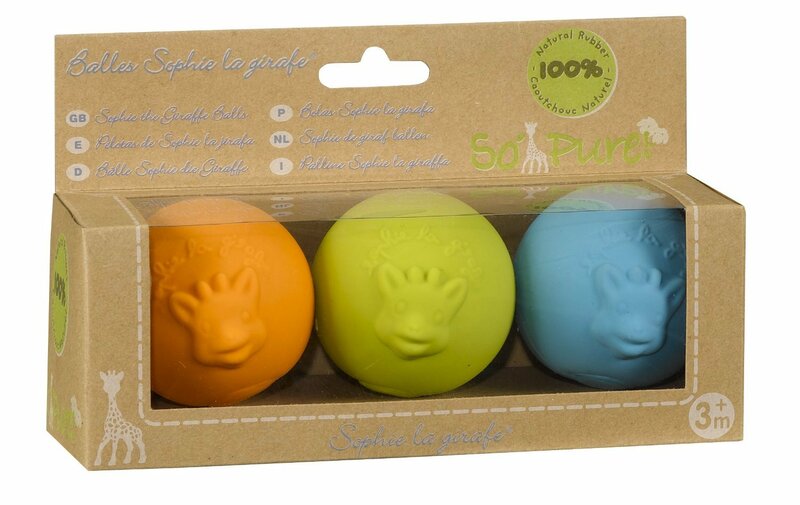 They have a very limited selection of baby toys; they are more widely known for their pacifiers, teething toys, and bath toys. 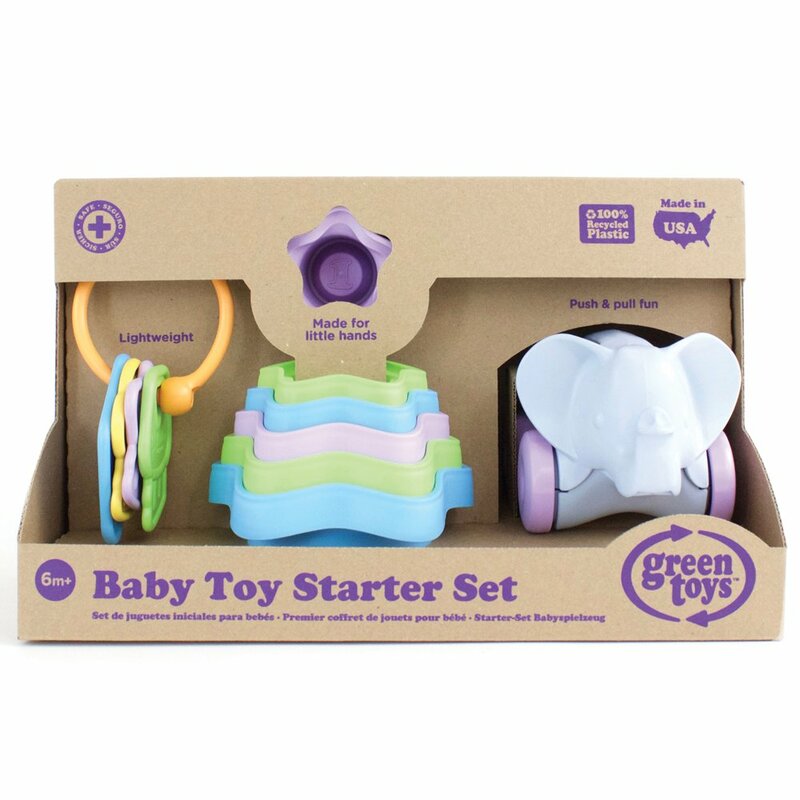 Green Toys: Made in the USA. 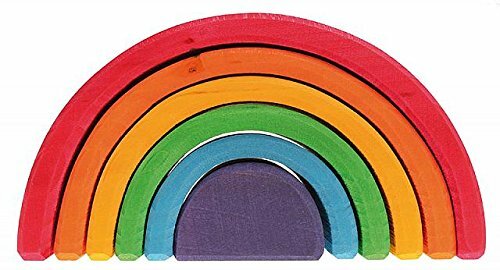 Can we get a big round of applause for toys that are all made in the USA? 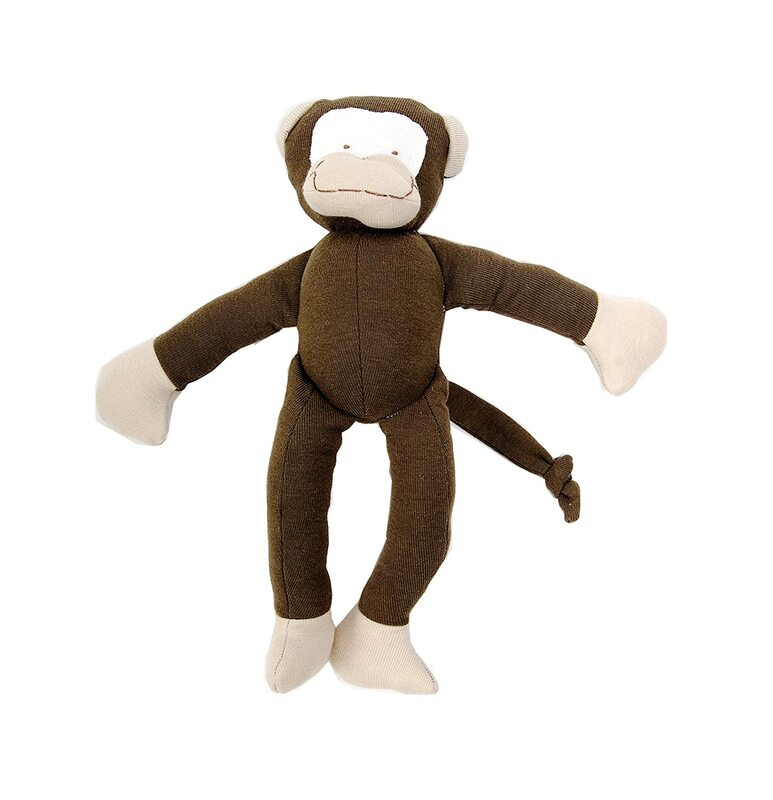 That’s what you’ll find at Green Toys, a California-based company that uses 100% recycled material. I’m so impressed by the amazing toys that they can make from recycled milk jugs! And proud they manufacture in the United States, keeping jobs here at home. Green Toys is the only plastic toy manufacturer to make this list because they use safe plastics: #2 high-density polyethylene (HDPE), #4 low-density polyethylene, and #5 polypropylene. These are the plastics used to make milk jugs, yogurt containers, laundry jugs, plastic cups, and plastic grocery bags. Though this is still plastic, I am comfortable letting even my youngest play with anything made by Green Toys. 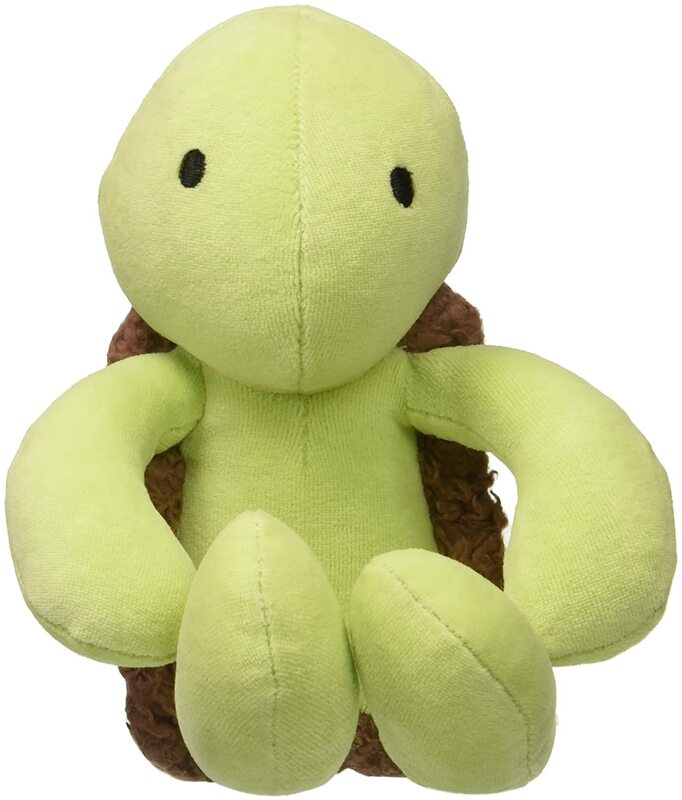 Did you find some non-toxic toys for your little one? I hope you found some that you love! Be sure not to miss my guide to safer bath toys. What about non-toxic dolls for babies? Is this current research? I don’t see a date on this article. Yes this was published in November of 2017. There are a few brands to be added but nothing on here is out of date to my knowledge. I would like to say how much I love this website. I never search or buy any baby products without checking here first! I was wondering if there are any non toxic activity gyms? I know the finn + emma wooden one, but it isn’t what I am looking for. Any suggestions appreciated. Thanks. Hi Marina, thank you so much! What is it about the Finn and Emma one you don’t like? That way I can help you find alternatives. Are there any options for outdoor baby pools that are good non-toxic options? Not really. Depends how young your LO is. You could try a stainless steel tub…? Otherwise I haven’t come across anything I would feel comfortable using. 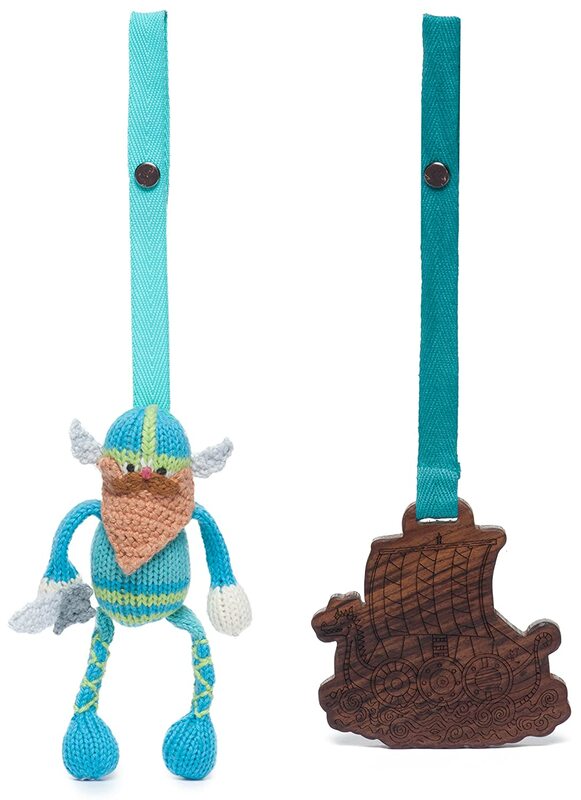 Smiling Tree is a great toy company that is based in Minnesota! Thanks for the recommendation. I’ll check them out! I love Smiling Tree Toys! Amazing quality.